Go Anywhere and Do Anything. Race day! Richard O'Hamill, C.E.O. & Founder of Stealth Belt, pictured here with Vice President Collin Jarvis at the Talladega Super Speedway in Alabama. Driver and Stealth Belt ambassador Ray Ciccarelli and his team are making sure their car is ready to roll! Al, loves to mountain bike and is into extreme sports as you can see form his photo. We were thrilled to hear that while riding through the woods at high speeds and jumping over obstacles he did not have any worries about his ostomy bag staying securely in place. Imagine if you didn't have to worry about your ostomy bag. What activies would you like to get into. Contact the Stealth Belt Team for ideas on the best belt for you or reach out to one of our Ambassadors who is an expert in their field. In May of 2007 I was diagnosed with colon cancer,and in November of that year my operation to remove the tumor left me with a permanent Ileostomy . I was depressed, and convinced that my life as I knew it would change drastically,and I would not be able to participate in all the activities I always had. I was very self conscious about my ostomy and tried to avoid situations that I thought would cause me more embarrassment. In April of 2008 I discovered Stealth Belt when surfing the net for some sort of solution. I have been wearing a Stealth Belt 24/7 since the day I received my first of several in the mail. It has allowed me to resume to 100% of the activities I enjoyed so much prior to my surgery. I have enjoyed baseball, curling, hockey, tennis, swimming, skiing, golf and yes, a totally normal love life. I have spoken at our local Ostomy association meetings and have recommended the belts to our Stoma nurses, and helped several people manage their own ostomy situation by convincing them to return to a normal life, by wearing a Stealth Belt. Thank you, thank you, thank you. I have enclosed a picture taken last weekend , of me, following my participation in the 10km portion of the Edmonton Marathon. Ray Ciccarelli Race Car Driver at Talladega Super Speedway "I look forward to continuing to bring awareness to living with Crohn’s disease and with an ostomy bag in hopes that my story will encourage people like me to never give up chasing their dreams and living life to the fullest. "Ray Finished 13th at Talladega Superspeedway in the ARCA racing series in May of 2017. He is the fastest man on wheels with an ostomy. 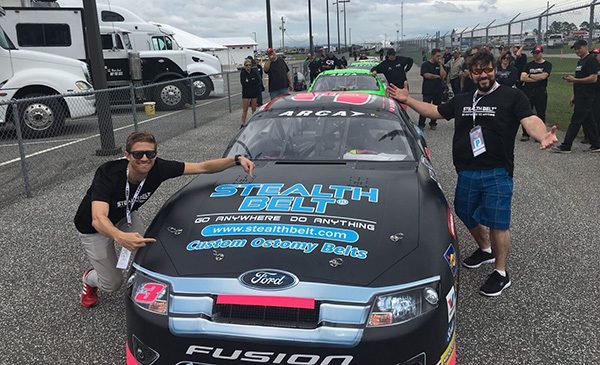 Ray invited the Stealth Belt team to the race to help spread awareness about living with an ostomy and product test the Stealth Belt Pro at over 185 miles per hour. Learn more about Ray Ciccarelli and his Racing Career. Retired from the U.S. Navy after 22 years on active duty. Stationed in the Persian Gulf, 2001 - 2003, in direct support of OPERATION ENDURING FREEDOM and OPERATION IRAQI FREEDOM. The military has equipped me with the mindset to improvise, overcome and adapt. That said, I was able to understood my diagnosis, overcame adversity and adapt to life with an ostomy. Sharing my journey affords the opportunity of being a source of inspiration and encouragement. Maintaining a positive attitude when faced with challenges allows for a better chance of overcoming adversity. My mantra is Attitude Determines the Ability for a Positive Transformation (ADAPT). Stealth Belt products allow me the opportunity to go about my daily activities while concealing my ostomy pouch. Additionally, my purpose is to educate others on the importance of colon screening, early detection, asking questions, doing research, and finding organizations that can help. Always forge ahead w/a purpose! Diagnosed with AFAP In 2012, a rare genetic disorder. You can read about Daniel's journey at https://www.army.mil/article/90122. Satisfied customer for 6+ years. Love my Stealth Belt! I've had an ostomy since 2011. After surgery, I tried various products until I happened upon Stealth Belt. The Stealth Belt worked much better than others in every situation: the office, when sleeping, and - especially - when active. Prior to surgery, I ran, biked and swam regularly. I wasn't sure I could get back to that but, with Stealth Belt, I was able to resume those activities and return to hard training. In 2012, I completed the 140.6 mile Ironman race using my Stealth Belt and have since competed in numerous other triathlons and marathons. Couldn't do it without their product...truly a life changer for me...and good people to do business with. Chris S.
Lauren and her poodle are enjoying a day at the park in her Stealth Belt Pro. In addition to spending time with her dog, Lauren is also an avid rock climber and active lifestyle enthusiast! You completely made our day/week/month! Thank you also for the new Stealth Belt, it will definitely come in handy as we try to keep up with Ashley. Ashley is 5 years old, and had her ileostomy surgery just last September. Ashley had surgery in China, then 3 1/2 years of therapy before ostomy - can't say how great SB was for Ashley. She says it changed her life.